United Fantasy Sword Cane Damascus | BUDK.com - Knives & Swords At The Lowest Prices! This fully functional fantasy sword cane from United Cutlery features a razor-sharp blade forged of beautiful Damascus steel. Each blade is double edged with a heavy, intricately cast pommel and leather wrappings on the handle. A coordinating wooden scabbard houses the blade and completes this exceptional design, only from United Cutlery. Cane talks. Wobbles below the release. Not well made. Better off buying cheap stainless steel. Very disappointed. I had just purchased the Kit Rae 1040 carbon steal (which I like save for also, a poor locking mechanism) and wanted a "Pommel" sword cane to balance out this binary collection I am trying to complete. The moment I pulled this sword cane from the box I only needed 10 seconds to inspect it before I decided it was going straight back. For $130 I expected quality, care of construction and excellent QC. None were to be found. The locking mechanism came with the catch filed down where there was no edge to catch, making the entire mechanism useless. On top of this the metal of it was so cheap it looks and felt like pot metal. It slides in and out with no catch and the fit in the cane is loose, meaning the cane will slip right off with any centripetal force. The hilt and pommel feel light and constructed with cheap materials and metals. Even the leather felt like second rate product and possibly synthetic. The mounting where the brackets meet the the hilt and scabbard had visible glue. And the blade when sheathed rattled around inside like a maraca. After all this the blade did not even matter. This thing looked cheap, felt cheap and is cheap and I am personally stunned that BudK would sell this, considering their reputation. This is a $10 item being sold at $130 and for the life of me I can't see how they can justify that price. No care or professional pride was taken into account when constructing this sword and as a result, back in the box it went for a full return and refund. And there is nothing to match the Kit Rae as an option to replace and exchange it (which I would have done had BudK had a worthwhile option). I am thoroughly disappointed and embarrassed for BudK, for selling this junk. The blade is Damascus, but other than that, this is a cheap child's toy. The "wooden" scabbard is cheap, thin plastic. The blade is extremely loose in the hilt. The latch doesn't catch most of the time. The leatherwork & finish on the pommel are extremely poor. The pommel is not heavy cast at all. Between the weak, plastic (not wooden, as advertised) shaft & the narrow, hard plastic, non-grip tip, this cane will not support enough weight to be usable as a cane at all. I don't know what the other reviewers received, but it definitely wasn't the same cane that I did. I will definitely be returning this one. Just got the cane via UPS today. Elegant and well made sword, beautiful to look at. Good size, vey sharp, appears to be an effective weapon. One problem: the sword rattles in the sheath. Kind of defeats the purpose of a sword cane. I hope to figure out a solution so that the cane becomes stealthy again. 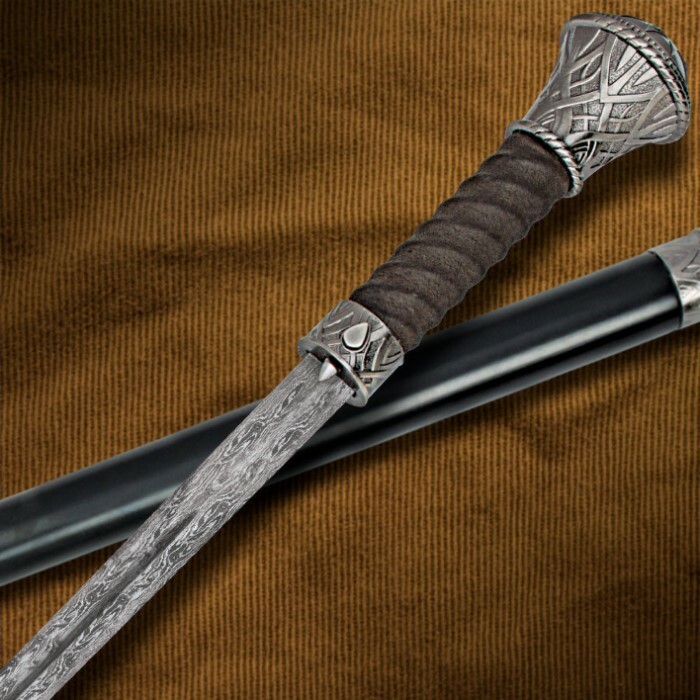 For once there is an affordable sword that has real damascus. Some would be skeptical about the authenticity due to the patterns being very light but in reality this is what makes the blade real damascus. The blades with darker etchings are usually acid etched and wouldn't be considered real damascus to most of the high end collectors. This on the other hand has a very light very smooth design, assuring that this is the real thing. Very well made and sturdy. 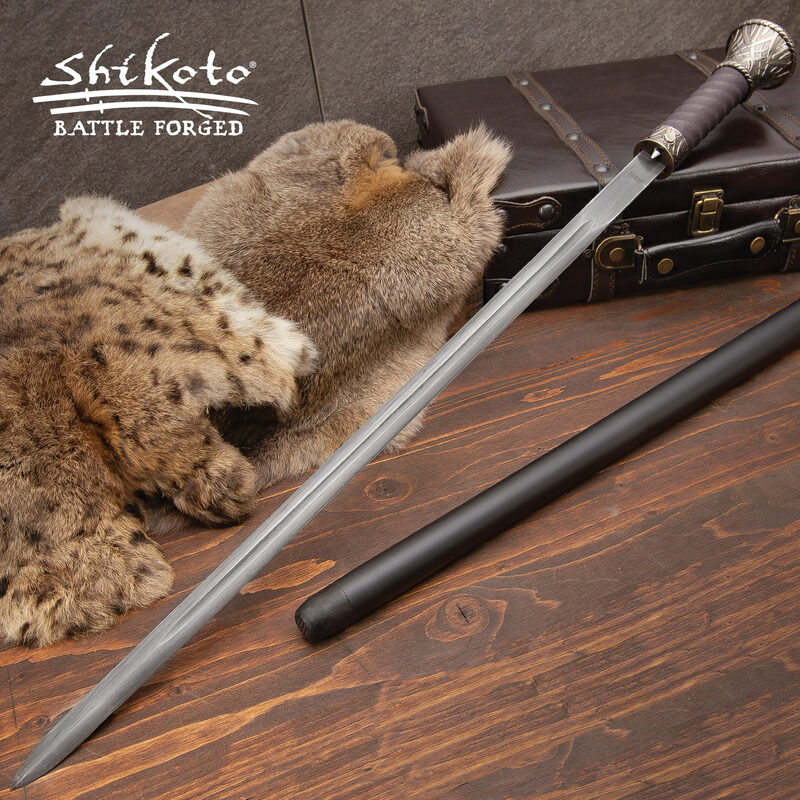 One of the better swords out there, and it even comes in a form that is both stylish and concealable for self defense. Huge bonus and great buy. I own several sword canes, this one is by far the best! I like it even more than I do the Kit Rae. These are beautiful and extremely well made. Mine is a perfect 'fit' of the sword in the cane - not so tight that it's hard to draw, not so loose that in slips or rattles. The blade is strong, sharp, and just flexible enough that it has a little spring, like the best rapiers. I've tested the sword on a wood target I use for knife and axe throwing and I can see how deadly it could be. The only reason I can think the other reviewer doubts the blade is Damascus is that the pattern in the blade, that shows where the steel is repeatedly folded, is very subtle. The head is beautifully crafted and heavy enough that the cane would be effective even as a club. I am totally satisfied with this very well made sword cane.I weigh 250 Lbs. and this cane is very sturdy and gives great support.The only thing I must say is that the blade does not appear to be a genuine Damascus blade. Other than that I feel that the cane is very well made.If I knew that the blade was not genuine Damascus I would have just purchased the other cane cause it didn't cost as much.Also I wished that you could not hear the blade rattle in the cane when you use it.